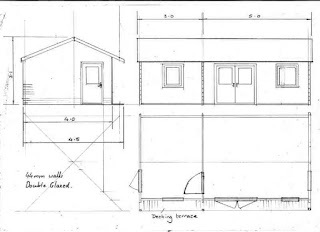 Similar to one of our existing garden office buildings the Carlisle log cabin but not quite big enough we produced a unique version to our customers specification. The log cabin is complete with adjoining store and is intended to be used for occasional dining and running a pottery and porcelain painting class. We insulated the walls, floor and ceiling and fitted underfloor heating as well as plenty of sockets for all the art equipment. Concrete base in place and we are ready for the log cabin assembly to begin. Having arranged the timbers assembly can begin. Windows and doors are slotted into place before the walls get too high. Up to roof height. 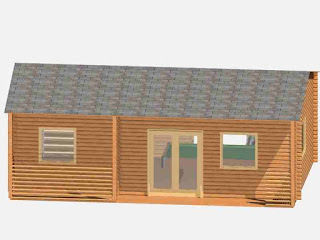 As this is a bespoke cabin and it is a double hipped roof it takes a little bit longer to assemble than standard log cabin kit roofs. The roof framework is complete and roof boards are ready to be fixed down. Again ths is quite time consuming as each board had to be cut with a 45 degree chamfer with this roof style. Roof boards and bitumen roof tiles in place, we can finally concentrate on the interior. Our client required the ceiling, walls and floor to be insulated and also required underfloor heating. Battens are fixed to the walls on 600mm centres and 50mm thick rock wool slabs are fitted between them. I created a wooden frame surrounding the actual window frame which had a 12.5mm rebate on the outside edge. This would therefore accept the 12.5mmm plasterboard creating a neat finish around the windows. In thoery you could plasterboard the return into the window and finish the edges with corner tape but this seemed like a neat and effective and quick solution to the problem. Tape and jointing is finished and the underfloor heating is in place above the floor insulation. We use the "Warmup" system which consists of a heating element in a foil layer which is ideal for laminate floors. The system has a temperature sensor fitted beneath the floor and power is supplied through an RCD controlled socket. The temmperature is controlled by a control panel which can be mounted anywhere in the room. Finished with oak effect laminate flooring it will then be ready for painting. Walls are painted with two coats of magnolia emulsion. You should be able to make out the temperature control for the underfloor heating on the far wall. The finished window frame worked very well. Ligthing has been added and we can start to pack up tools. The exterior is paineted with two coats of osmo wood stain & protector. This provides a durable long lasting finish which should not need retreatment for at least five years. Osmo paints are not cheap this cabin need 3-4 pots of paint at £45 per tin and it takes a full days labour to apply two coats. Our log cabin installation for this month is for Elizabeth Selby School in Tower Hamlets just off Bethnal Green Road. Quite a jounrey getting into Central London and quite a project too! Finally topped out with tongue and groove we can now make a start on tiling the roof. As standard we use bitumen roof shingles which we find produce a very attractive finish at a reasonable cost.